I can thank the Food Network for 70% of my food cravings. The rest can be attributed to a combination of hormones, food blogs, and advertising. So last weekends round of Throwdown with Bobby Flay, Good Eats, and Diners, Drive-Ins, and Dives left me craving chicken pot pie. I know that it’s getting beyond casserole season and that before I know it I’m going to be eating only and all fresh vegetables and fruits. That does not change the fact that I have a few more weekends of weather that makes me crave food that will stick to my ribs. Probably not good for bathing suit season, but that’s a price I’m willing to pay. Usually I prefer a biscuit-top pot pie. Mostly I’m a huge fan of the biscuit dipped in chicken gravy combination, and that’s the direction I head when I’m making pot pies. But one of the episodes we watched featured a puff pastry top, which sounded too good to resist. I also like to throw a few vegetable curve balls into my pot pies. The tried and true favorites are there- carrots, peas, and chicken. But I also enjoy adding pearl onions, mushrooms, and sweet potatoes. I also got the idea to simmer the cream/milk with a whole chipotle pepper from (who else) Bobby Flay. 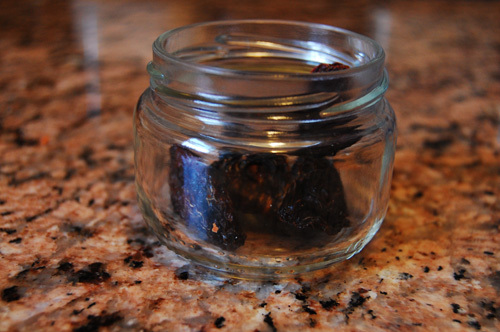 I love the flavor of dried chipotle, and so when I found whole dried chipotles at the co-op, I knew that it was going to be a good addition. I wanted the chicken to have a smokey flavor, but as I live in a one bedroom apartment in the outskirts of Washington, D.C, smoking food is not an option. So, instead I brushed the chicken with liquid smoke before I cooked it, which works like a charm. If I understand it correctly the way Alton Brown explained it, liquid smoke is made by trapping smoke that has been created by burning wood in a controlled environment, like a chiminea. The smoke is trapped and the condensation that is created is diluted (I believe.) Either way, it creates an authentic smoked flavor in meats and vegetables, and it’s a big coup in apartment cooking. This recipe is really easy, I promise. I suggest you read through the instructions before you start making it because it’s a lot of multitasking. As soon as you get one vegetable simmering or parboiling, there’s another task to start. As long as you’re able to focus and think about scalding milk while you chop, you’ll be fine. And I promise it’s worth it. It’s bold, spicy, sweet, and savory all the the same time. And since this type of food is going to be disappearing for the summer soon, it’s a great compliment to an afternoon of basketball. Begin by peeling and dicing your carrots. Heat oil and garlic, and add in carrots. Saute five minutes, then add in peas. While your peas and carrots are cooking over a medium heat, take out your pearl onions. If you have never worked with pearl onions before, you should approach them like you would a head of garlic. Cut off the ends on both sides, and take off whatever skin comes naturally. Don’t worry about peeling them all the way down. Dump them in a pot of boiling water, and parboil them for about 5-7 minutes. Then, strain them, and they’ll be ready to add to the peas and carrots. In order to get the skin off, just squeeze them a little, and the good part should pop right out. While your onions are parboiling, you’re going to scald your milk and cream. So, mix those two ingredients together over medium heat. Add in the chipotle pepper. If your milk comes to a boil before it’s time to add it to the other ingredients, simply simmer it. After your onions are parboiled and added to the peas and carrots, peel and chop your sweet potato, and bring that to a boil. You also want to parboil those, so boil them about 10 minutes until they’re medium tender. 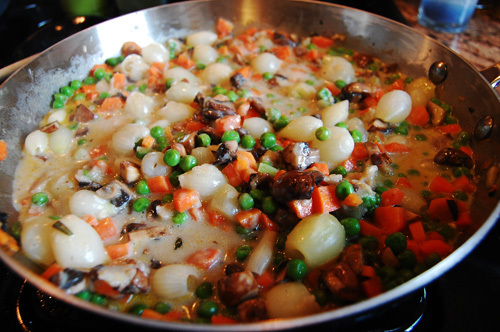 While your potatoes are boiling, rinse and chop your mushrooms, and add them to the pea mixture. Once your potatoes have joined their fellow ingredients, it’s time to stir in the milk and cream. You do not want the chipotle to join, so just add in the milk. I like to add in half the milk, and then add in the rest as the vegetables absorb it. At this time also add flour, rosemary, salt, and pepper. Now that most of your ingredients are happily married, you can bring the temperature down, put a lid on it, and let them simmer while your chicken cooks. 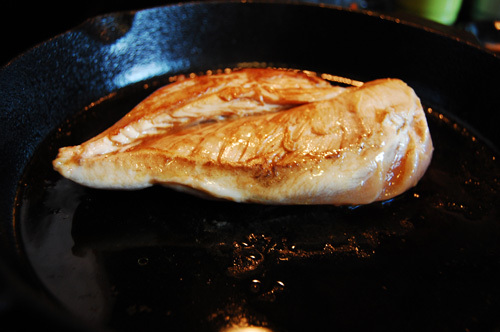 Go ahead and brush the liquid smoke over the chicken, and heat oil in a saute pan. When your pan is hot, dump your chicken and any liquid smoke left in the bowl into the pan. Cook your chicken all the way through. When it’s done, dice it, and add it to the rest of the ingredients. If your liquid is looking low, you can add the rest of your milk. Let the whole mixture simmer while you heat the oven to 350. Your puff pastry should be thawed (that takes about 40 minutes, so account for that during the preparing). If you’ve not worked with puff pastry before, it’s super easy. Let it thaw as it comes in the package, folded. When it’s thawed, lay it out on a lightly floured surface and make sure it’s all in one piece, mend any cracks. When your oven is hot, dump your simmering ingredients into a casserole dish. 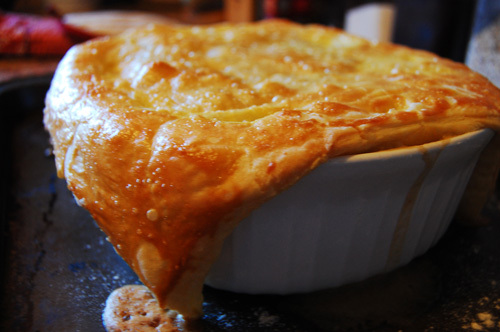 Drape the puff pastry over the dish, sealing all the edges. 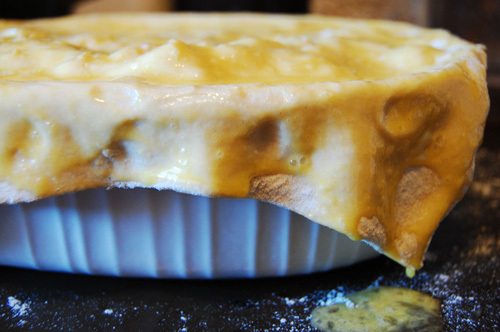 Brush the top of the puff pastry with egg, and bake for 30 minutes. Let cool slightly, and serve. While I hate to bog you down with any one kind of food (except, of course, for pie), I also really hate to publish recipes that I don’t think are up to par. And while last weekend’s Jalapeño Bagels were tasty and the perfect food for our massive hangovers, they were not the perfect bagel. 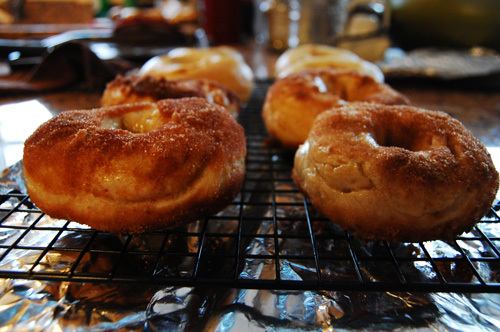 And the round two of bagels that we cooked up on Sunday were also good (especially the cinnamon sugar- worth the mess), but they were dense and still not right. And I want everything I put out there to be right. Good. Recipes that I am proud of. So today I present to you round three of the great bagel experiment. The recipe we ended up using as our primary source was one from the L.A. Times. 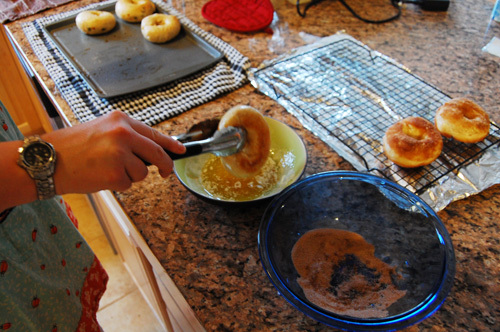 While we added more water than the recipe called for, and used the hole-punch method of forming the bagels instead of the roll-out method, we stuck to the recipe for the most part. We made three varieties- jalapeño, blueberry, and cinnamon sugar. And while I hate to brag. These are the perfect bagels. The last time we attempted cinnamon sugar we made the awful mistake of putting on the cinnamon/sugar mixture before we baked them, which lead to a caramelized mess that I will be taking heat for from now until eternity. I just didn’t believe that applying the mix after you baked it would be sufficient, but it turned out that it is. We learned that if you brush the bagels with butter and coat them with the mix as soon as the come out of the oven, the mix will get embedded as the bagels cool. I know, I wouldn’t believe it either. My advice- pretend like it’s french toast. Have two bowls sitting side by side, one with melted butter and the other with the mix. Dip, dip, and then on to the drying rack. 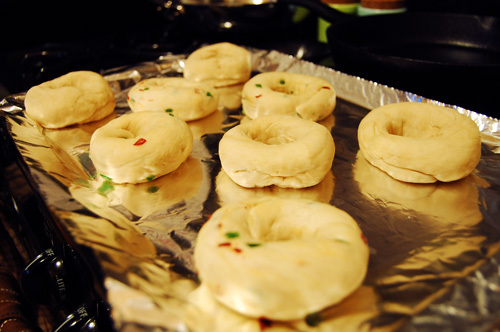 Unlike the first recipe we published, this round calls for allowing the bagels to proof over night. Proofing is the process of yeast converting the glucose to carbon dioxide, essentially what makes the bagel “rise.” Not all bagel recipes call for a retardation process, which is when the bagel is allowed to rise in the refrigerator for an extended period of time. Rumor has it that bagels that have been allowed to retard have more flavor, and I am always one to ere on the side of flavor. 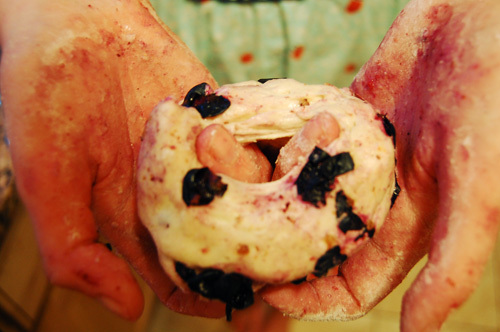 I will leave you with my advice on making blueberry bagels. Because we took a batch of bagels that was big enough for 12-16 bagels and divided it into three flavors, there was some debate about when to add the distinguishing ingredients. We decided to add in the flavor makers after the dough had proofed for an hour in the fridge, but before we rolled them out. This worked BEAUTIFULLY with the peppers. It did not, however, work so well with the blueberries. I learned that the lovely “bursting” quality the the blueberry exhibits adds unwanted moisture to your proofed dough. We ended up adding extra flour and letting them retard an extra hour, but my recommendation would be to add the blueberries in the original mixture, so as to allow the blueberry-induced moisture to factor into how much water you use ultimately. Using a stand mixer or by hand (but not a hand mixer), combine all ingredients (except the last cup of water). 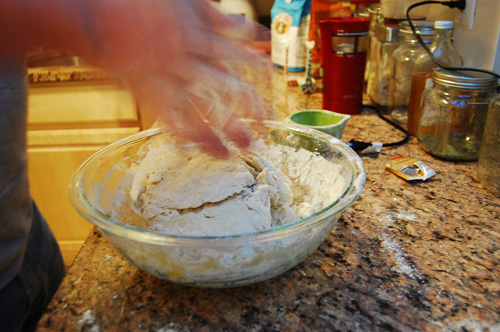 If you’re mixing it by hand, use a wooden spoon to combine initially, and then knead with your hands. Add the last cup of water as you need it. You want the texture to be satiny and kind of tacky. Knead for three minutes. Allow to rest for five. On a lightly floured surface, knead the dough an additional five minutes. The dough should be stiff, slightly tacky, and smooth. If it is crumbling and falling apart, you need to add more water. Lightly oil a mixing bowl and place in the ball of dough. Cover tightly with plastic wrap and let retard in the refrigerator for at least an hour. The dough will need to be formed before it goes in over night. 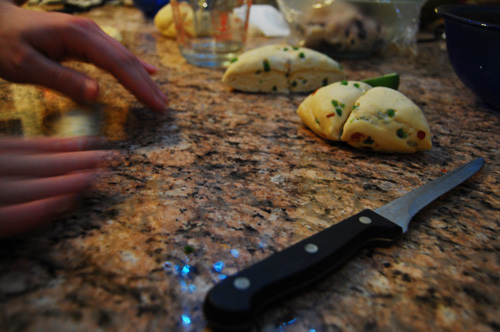 On a completely dry, clean surface, divide the dough into 12-16 pieces. Form each piece into a loose, round ball by rolling it out on the counter. If the dough is sticking to the surface, add a little water, which will make it tense up. Once you’ve formed balls, poke your thumb through the center to create a hole. Work out from the whole to make an evenly shaped ring. Repeat for each ball, placing them on a wax paper lined baking pan. When done, brush them with olive oil and cover them tightly with plastic wrap. Place them in the refrigerator overnight. 90 minutes before you’re ready to boil your bagels, take them out of the fridge and let them return to room temperature. It takes about 40 minutes for 2 gallons of water to come to a rolling boil, so keep that in mind when you put the water on. Once the water is boiling adding the remaining salt and baking soda. Set the oven to 500 degrees fahrenheit (which will take 30 minutes to preheat). 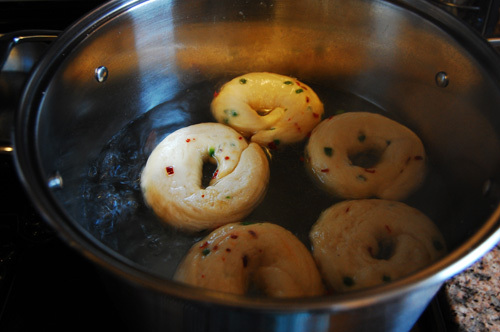 One by one, drop your bagels into the boiling water. Boil for one minute, flip, and boil an additional 30 seconds. Return to wax paper lined sheet. Place the sheet into the oven and reduce the heat to 450. Bake for 8 minutes, and then rotate. Bake until golden brown- an additional 8 to 12 minutes. Remove from the oven onto a rack. There are only a few foods that I am very emotionally attached to, and as I’m sure you realized this week, pimento cheese is one of those foods. But, as I mentioned, I’m a bit of a purist when it comes to pimento cheese, and so in approaching today’s recipe, I had to take a very liberal interpretation of what was suggested. A lot of times (outside of baking) a recipe is really just that… a suggestion. This recipe is from a Food Network Challenge burgers special. It was actually the winner, and I have since seen it in a number of T.G.I.Friday’s commercials. The recipe is good in theory, though there are certain elements of it that I’ve rewritten. Beyond the pimento cheese, the recipe calls for ham to be put in the food processor and added to the burger. I think ham is gross, but Dan loves it, so I put ham in his but not in mine. I also added my own flavor twist on the burgers, adding horseradish and soy sauce. I thought that the honey cole slaw was such a great idea. I am all about new twists on classic southern fare. For our wedding Beaufort Grocery is making mango cole slaw, which I’m so excited about. Sometimes during the summer I think a light blueberry cole slaw is perfect, and sweet cole slaws add a different element when they’re combined with things like burgers and barbeque. Start by making your pimento cheese, since that will need to settle a bit. Find the instructions here. Next, make your cole slaw. Finely chop your cabbage. If you can’t find a head of cabbage at the market, you can usually find a bag of already shredded cabbage. Traditionally with cole slaw I blend the ingredients in a food processor, but with this I just used a spoon to combine the ingredients. 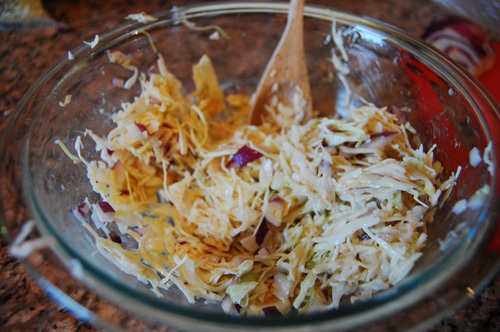 Mix together your cabbage, honey, mayonnaise, and a little salt and pepper. I like to make my patties a few hours before we’re going to eat them so that the flavors have time to really meld. So to start go ahead and dump your ground beef into a mixing bowl. Use a silicon spatula to spread it out a bit, and create a well in the center. Add the horseradish and soy sauce, and blend until totally combined. Since I was making one patty with ham and the other without, I took out half of the meat, formed a patty, and set it aside. 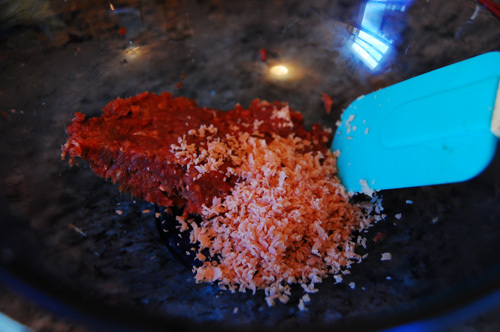 Put your ham in the food processor and chop until in tiny pieces. Add the ham to the remaining meat and combine until smooth. Make your patty, cover, and refrigerate for a few hours until you’re ready to cook. When you’re ready to start dinner, go ahead and cook your bacon. When the bacon is done, set it aside and retain 1 tbsp of the grease in the pan. Over medium heat, start your burgers. 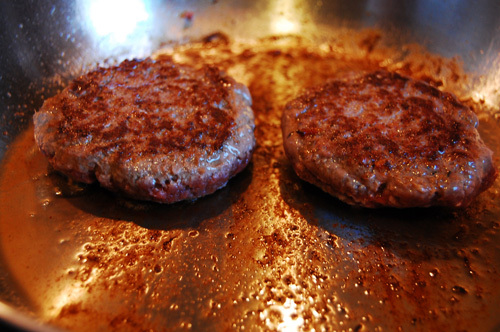 For a medium rare burger, you should cook them 7-10 minutes on each side over medium heat. 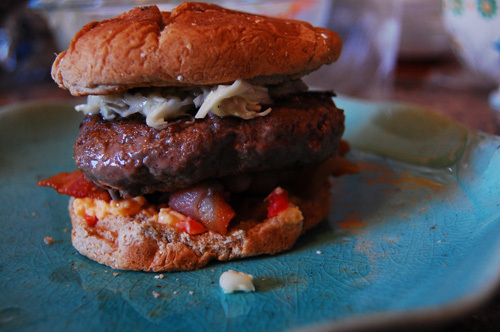 While the burgers are cooking, toast your buns and then spread a layer of pimento cheese on the bottom bun. Top by two strips of bacon on each burger. Add the burger when it’s finished and put a healthy serving of cole slaw on top.